Though it’s still about the size of Delaware, the so-called “dead zone” in the Gulf of Mexico is much smaller than researchers were expecting this year. Scientists with the Louisiana Universities Marine Consortium, or LUMCON, reported Tuesday that the 2018 zone measures about 2,720 square miles, far smaller than the 6,570 square miles they had predicted based on the water quality in the Mississippi and Atchafalaya rivers. The dead zone is an area of water that’s been starved of oxygen, dispersing or killing marine life in it. 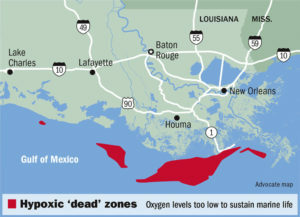 Nancy Rabalais, an LSU professor who works with the consortium, said the smaller dead zone could be the result of a storm that disturbed the water in the Gulf, circulating oxygen back into depleted areas before they could be measured. She also said prolonged winds from the west may have helped keep the zone smaller than predicted. The Gulf’s dead zone is formed when nutrients — mainly excess fertilizer with high levels of nitrogen — are washed into the Mississippi River, which drains about 41 percent of the contiguous United States. The Mississippi and Atchafalaya rivers then dump the nutrients into the Gulf. Microscopic floating organisms, called phytoplankton, feed on the nutrients and grow into unusually large blooms. When they die, their decomposition draws oxygen out of the water. The 2018 dead zone is far smaller than last year’s record zone, which at 8,776 square miles was about the size of New Jersey. The average size of the Gulf dead zone is 5,375 square miles, which makes it the second largest recurring hypoxic zone in the world. “Although the area is small this year, we should not think that the low-oxygen problem in the Gulf of Mexico is solved,” Rabalais said. The Environmental Protection Agency’s Hypoxia Task Force has set a goal of 1,930 square miles for the dead zone. Hypoxic zones can occur naturally in some marine environments, such as deep ocean basins, but their annual appearance near the Gulf Coast is attributable to human causes, scientists say. Such zones can have a significant impact on seafood industries, mainly through habitat loss, the changing of migration patterns and effects on species’ reproduction, though the exact scale of the impact is not known. The Hypoxia Task Force is working to reduce the nutrient load in the Mississippi, including helping farmers figure out ways to reduce fertilizer runoff, such as by using less fertilizer in the first place.